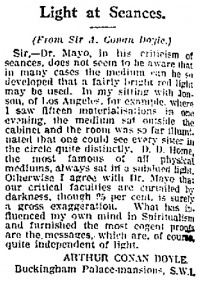 Light at Seances is a letter written by Arthur Conan Doyle first published in the Daily Express No. 8313 on 16 december 1926. Sir, — Dr. Mayo, in his criticism of seances, does not seem to be aware that in many cases the medium can be so developed that a fairly bright red light may be used. In my sitting with Jonson, of Los Angeles, for example, where I saw fifteen materialisaitions in one evening, the medium sat outside the cabinet and the room was so far illuminated that one could see every sitter in the circle quite distinctly. D. D. Home, the most famous of all physical mediums, always sat in a subdued light. Otherwise I agree with Dr. Mayo that our critical faculties are curtailed by darkness, though 95 per cent. is surely a gross exaggeration. What has influenced my own mind in Spiritualism and furnished the most cogent proofs are the messages, which are, of course, quite independent of light. Buckingham Palace mansions, S.W. 1. This page was last edited on 21 July 2016, at 13:02.